Many writers struggle with knowing how to make their plot tight and their story flow. One technique for drafting or editing our stories into shape is using story beats. Story beats (or turning points) are events or points in the story that direct the narrative to a new direction. They give our story a structure that can make it easier to outline in advance, to use as guidelines when writing by the seat of our pants, or to revise and edit a finished draft. I have a whole collection of beat sheets to help us no matter whether we need more direction for plots or for characters. But it can be tricky to understand how to use beat sheets. Let’s do a round-up of the many beat sheet and story structure resources here on my blog, and then I’ll introduce you to other resources around the web that might help us understand beat sheets. But even with all that information, we still might struggle to understand what beats look like in “real” stories or how to recognize beats in the books we read or the movies we watch. In my workshops, I’ve often had people ask me to give examples of beats from XYZ movie or book. I understand. Sometimes seeing examples can help, and luckily for us, several blogs run “beat sheet breakdown” posts and series. I’ve found it interesting to read through many of these examples and see how beats fit (or don’t) the story. Some of the beat sheets under the Save the Cat site admit that the movie beats don’t fit the “ideal” beat sheet. And a new resource just opened this past weekend with several more story structure breakdowns—and allows for submissions to add your own examples. 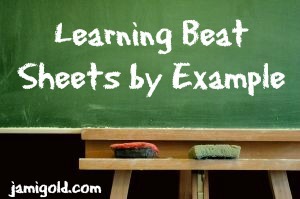 Many of the examples listed fit with the same beats as on my Basic Beat Sheet. Between all of those resources, I hope we’ll be able to see what beats look like and how they fit with each other to create a story. However, as I mentioned with the Save the Cat beat sheet examples above, it’s good to recognize that beat sheets are just a guideline. We should treat them as a tool and not a rule. We don’t want to create formulaic stories, and if we pay more attention to getting the beats on the exact right page than to the overall story flow, we’ll create stories with fluff or uneven pacing. an event that forces a choice to get involved. an event that adds new stakes to the situation. an event that steals the protagonist’s hope for a solution. an event that forces the protagonist to face the antagonist. However, even with those major beats, “close” might mean within 5% of the recommended page number for a novel. The other beats are even more flexible. As long as the pacing and development work, we don’t need to worry about readers counting pages to see how close we got. Luckily, novelists don’t have to be nearly as exact as screenwriters. Are you able to analyze story structure in movies and books? Have you struggled to recognize story beats and turning points in real stories? Do examples help you understand tricky concepts? Were you familiar with these example resources before? Do you know of any other resources for story structure or beat sheet examples? All those links to examples are a fabulous resource. I’ll admit, I wasn’t 100% sure how to use beat sheets so these are really helpful 🙂 Thanks! For me, showing vs telling didn’t really click until I saw examples of how to take a “telling” sentence and change it to be “showing.” And the same thing with how to tighten sentences–examples really helped me there too. So I know how much seeing examples can help. 🙂 Good luck and thanks for the comment! Awesome post! And thanks so much for the shout out for the Database! Thank you for putting all the awesome work into it! 😀 Thanks for stopping by! I use the StC ones as a basic guideline. This is very helpful. Thanks! Yes, beat sheets are great for giving us guidelines. I write by the seat of my pants, so I just like understanding how stories are supposed to flow, and beat sheets can show us that overall structure. 🙂 Thanks for stopping by! As you noted in your FB message, a tightly structured story doesn’t necessarily mean simple (such as lacking in subplots). In some ways, structure is about creating the sense that the story is moving toward something–that there’s a purpose to events. So in that sense, if you have that feeling of forward movement and purpose, that is a tightly structured story. 🙂 Thanks for the comment! The Ending of Stories | Beverly Rearick, Writer!